Normally, I don’t go out of my way to post articles about every little piece of news to hit the internet, but in the case of Fringe, I’ll make the exception. The show, currently in its fourth season, is beloved by us here at The Fandom Menace and for good reason. Fringe is easily one of televisions most unique series, filled with clever story lines, beloved characters and mind-boggling twists and turns. But things haven’t looked good for the show as of late. An erratic airing schedule and constantly fluctuating ratings have put the series in danger and, for the past few weeks, rumors have been surfacing that producers were forced to shoot a season finale that also acts as its series finale. While a short warning is better then no warning at all, the idea that a show like Fringe would literally have one episode to wrap up its intricate story seems not only unfair, but damn near criminal. Luckily, that is no longer an issue. 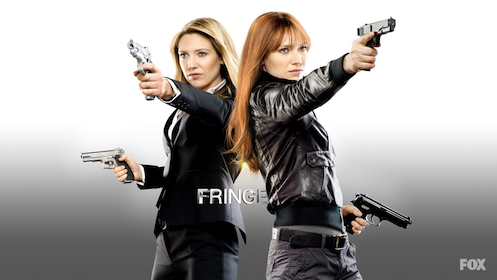 Today, FOX announced that Fringe has been renewed for a fifth and final 13 episode season. This final run of episodes will allow the creative team the time and space it needs to bring the epic series to a logical and thought out conclusion instead of slamming the brakes on a series that was clearly building towards something incredible. While I would love the series to live out its planned seven seasons, I understand that television is a business and a series with a small but loyal fan base doesn’t make the network a lot of money. I applaud FOX for giving both the producers and, by extension, the fans the gift of a final thirteen episodes to bring the story of the Fringe devision, Massive Dynamic, and the Observers to an end it deserves. You can read the entire story at the Hollywood Reporter. ~ by Andrew Craig on April 27, 2012.